My favourite book is the Dressmaker by Rosalie Ham. 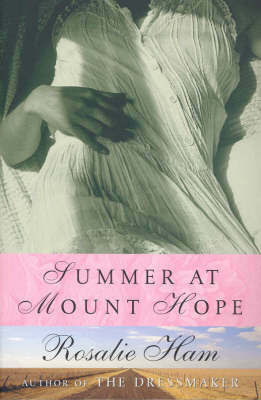 I have just finished reading Rosalie's second novel, Summer At Mount Hope. It has the same sense of humour, the same chatty pace, and the same social commentary that I enjoyed so much in her first novel. I highly recommend this story to anyone wanting to read a truly Australian novel. It deals with the drought, pastoralists and squatters, the depression and itinerants, shearers striking and demanding more money, suffragettes campaigning for women's rights, and the advent of new technology. Despite being crammed full of issues, Rosalie balances everything very well. Surrounded by sheep farmers, Phoeba Crupp's father grows grapes. She is strong and plain, and very intelligent. Her younger sister is the opposite. Phoeba wants to inherit her father's farm and grow grapes. She wants to be free, and she only wants to marry if she is deeply in love. The community is struggling with the drought, and what the weather does is crucial to their survival. Their lives are turned upside-down, and Phoeba thinks she has been dispossessed and makes a compromise. It all seems kind of sad, and certainly isn't very emotionally satisfying. But this is what I enjoy most about Rosalie Ham's writing: she's realistic. Not everyone's perfect, and not everyone gets to live happily ever after. But the ending of this novel shows that Phoeba's compromise must have resulted in a very prosperous and rewarding life. Hopefully she was happy. A title I hadn't heard of - thanks for bringing it to our attention. It does sound sad, but I think you've hit on an important point - truly rewarding experiences are rarely our happiest ones. I haven't read anything by this author, but your enthusiasm made me add The Dressmaker to my TBR list. It sounds like she is a fantastic author. Thanks for sharing!